Southern Gal Meets Midwest: Happy Saturday! The weekend is here...Yea!! I am so excited, happy and honored to be featured on Saturday Spotlight today. Thank you Kris for inviting me to participate in your fun series. I have had my blog up and running a very short time so if you would like to know a little more about me you can stop by and see Kris at Junk Chic Cottage. Hi Karen, I'm popping over from Kris' blog and wanted to congratulate you on the feature! I love hearing a story with a happy ending and it sounds like yours is a very happy one. Looking forward to following your posts. Have a great weekend! Good Morning Marie, Thank you for coming by to visit. I am truly blessed in this life and was so happy to share my story. I look forward to following all you ladies and seeing the great ideas and talent out there. I will be over to visit you too. Have a wonderful weekend! I will stop by to visit your blog too. Have a great weekend! 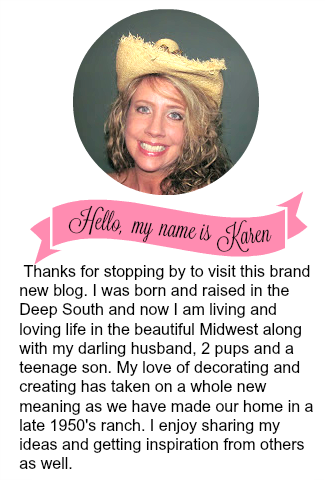 I just came by from Kris's blog - welcome, Karen!! Kris featured me last week - isn't she just the sweetest?? I am in love with your pups - I have two Jack Russell pups right now but before they came into my life I had a Pomeranian - I loved him to bits even though he was such a punk!! I look forward to exploring more around your blog - once again, Welcome to Blogland!! Big hugs!! Hello Debbie, Thank you for the warm welcome and yes...Kris is just a gem! I am coming over to your blog to visit as well. What mountains are you located in? I lived in the North Georgia Mountains for awhile before I came to the Midwest. That is so funny with the pups...I was thinking there could be no other like us with this pooch combo! Believe me it is a circus around here sometimes with those two....they keep us on our toes....LOL! It's very nice to meet you today and Take Care. Oh, how exciting, my friend! I will head over there now.... Hugs! Thanks for stopping by today Stephanie....I hope you enjoy the rest of your weekend! Thanks for stopping by Nancy, I have been enjoying visiting your blog as well. See you soon and I hope you enjoy the rest of your weekend! Hi Karen stopping by from reading your spotlight over at Kris's. I am now a follower and I enjoyed your spotlight. Hello Vera, thanks for coming by and I am now going over to your blog to visit. Thanks for stopping by Kim, it's very nice to meet you today. I am headed over to your blog now. Have a great week!